DUBLIN, Ireland, 2017-Mar-07 — /Travel PR News/ — Ryanair, Europe’s No. 1 airline, today (28 Feb) launched its first Frankfurt Main winter schedule (2017), with 7 based aircraft (an investment of $700m), 20 new routes to Athens, Barcelona, Brindisi, Catania, Glasgow, Gran Canaria, Krakow, Lanzarote, Lisbon, London, Madrid, Manchester, Milan, Pisa, Porto, Seville, Tenerife, Toulouse, Valencia and Venice (24 routes in total), which will deliver over 2.3m customers p.a. and support 1,750* jobs at Frankfurt Airport. 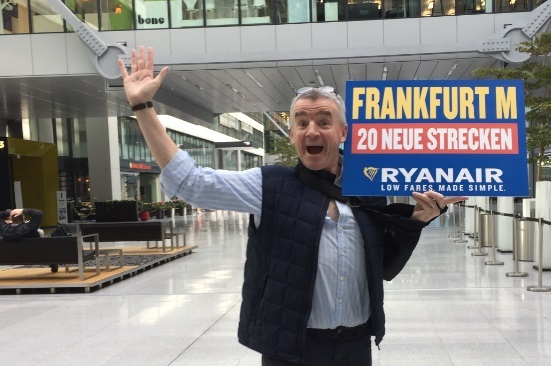 This entry was posted in Airlines, Airports, Flights, Travel, Travel Services, Travelers and tagged Frankfurt Main winter 2017 schedule, Michael O’Leary, Ryanair. Bookmark the permalink.